With its evocative main face and O-shaped mouth, its mysterious zigzag etched lines, the Shigir Idol is now accepted as one of the world’s oldest examples of monumental art. The Idol is now kept at the Sverdlovsk Regional History museum in Yekateriburg. One is that it is believed to have stood tall over the long-gone Shigir paleo-lake. Another is that it held this position for a mere 20 or so years. 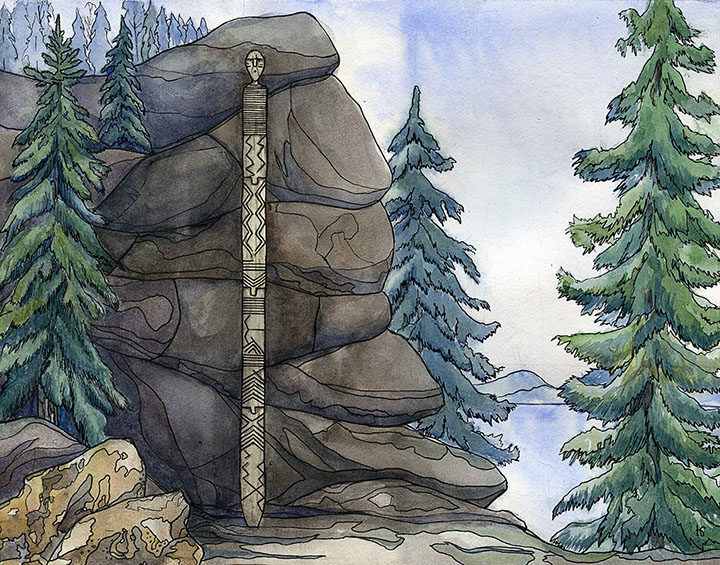 While some scientists have suggested it resembles a Totem pole, experts insist the lower part of the Shigir Idol was not – as might be expected – dug into the ground to support it. Rather, it was propped up against a tree or perhaps more likely against a rock face on the shore of the water. The idol has already shattered our understanding of early ritual art by the hunter-gatherers at the end of the Ice Age, all the more so when tests revealed last year proved it to be older – it was created some 11,500 or 11,600 years ago – than previously understood. It reveals a depth of artistic talent unexpected before the onset of famers. Department in Institute of Archaeology, Russian Academy of Sciences, has told The Siberian Times: ‘Based on the the facts I can clearly say that it was not dug into the ground, like Totem poles. ‘It was standing on a relatively hard, presumably stone, pedestal, because the lower part got flattened by strong pressure, and this sculpture was quite heavy. ‘According to the dendrologist Karl-Uwe Heussner, the Shigir Idol stood like this on shore of a large Shigir paleo lake for about 20 years; then a large crack appeared in the middle, followed by a series of smaller cracks. The idol may have been tied by strapping to harness it in place but was not held by another structure. ‘We did not find any trace of a counterforce,’ said Dr Zhilin. ‘If supporting beams or forks were used, it would leave clear traces, but we do not see them. ‘There was an idea previously that the idol could be put on a raft and was floating on the lake. ‘We have no data to confirm this. He surmised: ‘There are two options – it could be leaned against some rock or a tree. ‘You just need to remove several branches from, say, pine or fir tree, to get the suitable space for the idol; a leather strap might have fastened it into place or something alike to rawwhide straps that would not leave any significant traces. The Idol was made from a larch tree 11,600 years ago. Dr Zhilin has also clarified claims based on earlier an scientific research publication that this Mesolithic Age idol depicts demons. ‘While we can’t be sure on what the Idol depicted, we mustn’t underestimate people who created it. ‘They had all the necessary tools and skills, plus a rather complex view of the world which to them was populated with spirits. Not only animals or trees, even stones were animated. ‘We think it was something close to animism’, Dr Zhilin said. ‘We are a long way from unravelling the ancient code left by the creators of the Shigir Idol. There is nothing in the world similar to the Idol, no written data left. The Shigir Idol is on display at the Sverdlovsk Regional History Museum in Yekaterinburg. The stunning idol is three times as old as the Egyptian pyramids.